I’m back, and I don’t mean that I’m just back from an abnormally long blog absence. I’m back from vacation. It was spring break last week, so my sister and I took a road trip to Nashville via Asheville, NC. So, it’s time for some vacation posts. First up is the food. When we set out, we said no chain restaurants on our trip. We didn’t stick to our guns 100% since we ate a quick lunch at Taco Bell as we were leaving her house, a quick dinner at CiCi’s Pizza before rolling into our host home in Nashville, and a random smattering of fast food on our way back from Nashville since we drove straight through, making it a very long time in the car that we just wanted to get over. Despite the numerous times of cheating, we discovered some great new places to eat on our journey. Our very first non-chain experience was a bust. I’ll leave the little cafe in downtown Asheville nameless to protect the guilty, but suffice it to say that the place was not worth writing home (or cyberspace) about. The sweet tea wasn’t even good. Messing up sweet tea in the south is a no-no. But, then we got on the road between Asheville and Nashville and stumbled into a wonderland of food. I saw a random billboard on the highway about “throwed rolls” and $5 lunch specials, and I told Jillian to look the restaurant up on her phone. I had been so enthralled by flying bread that I exited one exit too soon, but we wound through the town of Newton, TN until arriving at this inauspicious site. Clearly, the place is not a chain, and it even looked a little scary, but we were hungry, and there really isn’t too much on the highway around Newton. 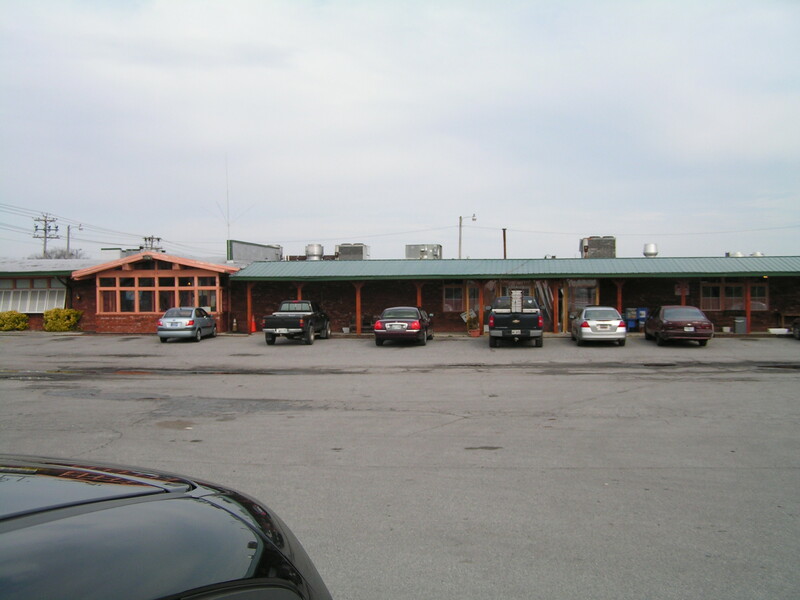 Little did we know that soon we’d be rolling out of Brandywine Creek Steakhouse and Tavern, resisting the food comas that nearly overtook us. They knew how to make sweet tea right. 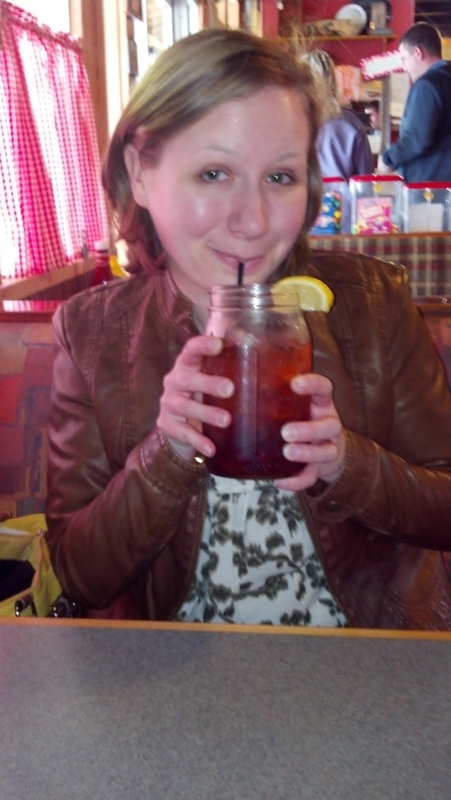 Here’s me eagerly sipping it out of my mason jar since that’s really how sweet tea should be served. When my food arrived in a skillet, it only took me a bite or two to discover that Brandywine knows how to use the three main Southern seasonings to perfection: sugar, butter, and crisco. My “hub cap” chicken fried steak was smothered in delicious gravy and was melt in my mouth tender. And, the green beans were almost like my mom’s, which is basically equivalent to saying that these green beans were runners-up for the best green beans in the world. Seriously, my mom’s green beans are actually requested at family parties. Don’t forget hush puppies. While we were eating, my sister wondered what the origin of them are. I was able to pass along the story that my grandma used to tell. In the Civil War, soldiers often needed to keep their dogs quiet, so they would fry cornbread and throw it to them to hush the puppies. Wikipedia says this is dubious, and if I threw fried cornbread at any of the dogs I know, they’d basically swallow it whole and continue to bark their fool heads off, but it’s a nice theory, so I’m going to stick with it. Across the table, my sister was close to licking the plate after finishing her Fried Taters ‘n Onions. I actually think she could sub in for Guy Fieri if he ever needs someone to visit a diner or dive. Her review was that enthusiastic and verbose. I’m sad this restaurant isn’t closer to me, but at the same time, it’s probably good. I usually eat to live, I don’t live to eat. 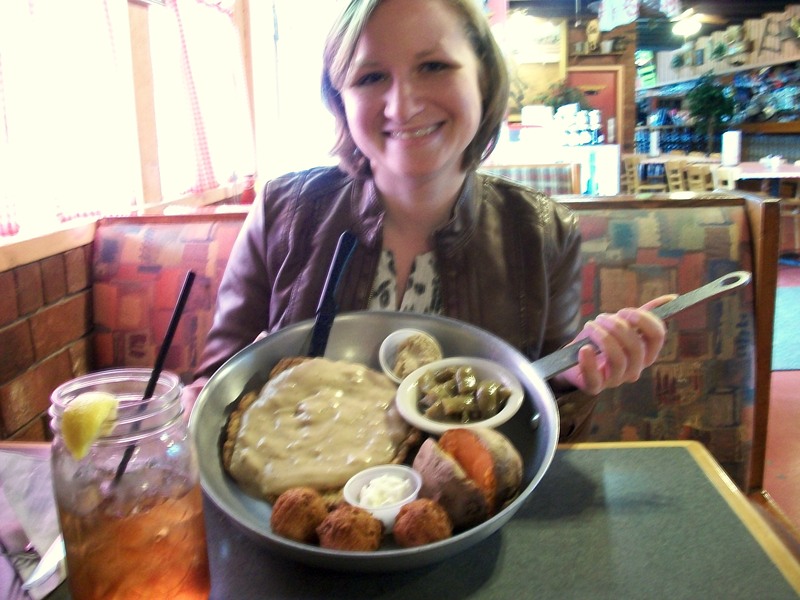 So, when I’m motivated to try to eat a 12 inch skillet of food in one sitting, the results could be disastrous to my waistline. Another local establishment that we enjoyed was The Pfunky Griddle, which lines a road on the outskirts of Nashville along with some other adorable shops including one clothing consignment shop with an exterior painted to mimic a Burberry pattern across the entire front of the house. 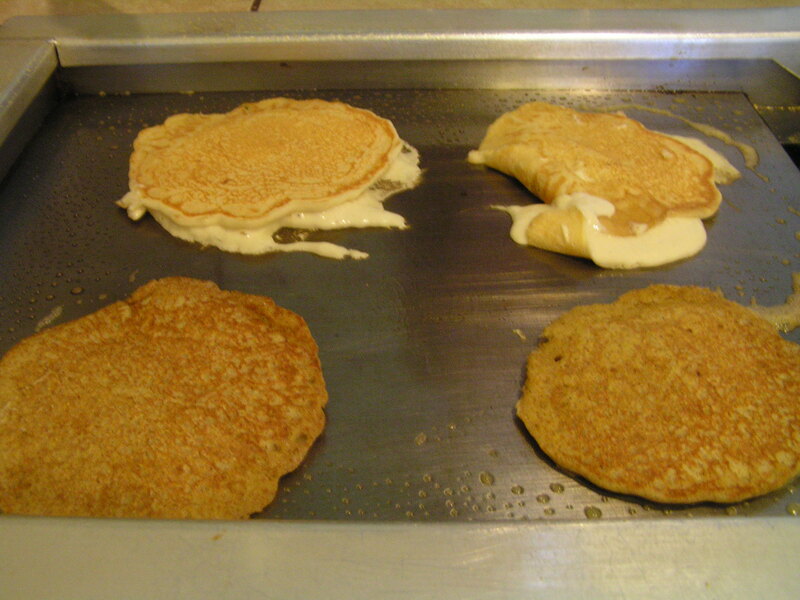 What makes The Pfunky Griddle so fun is that you cook your pancakes right at your table on a griddle. As we were getting ready to go in, Jillian informed me that she had never made a pancake before. I don’t know how someone can live to be 29 without ever making a pancake, but I tried to remember that not everyone goes to grad school and subsists on a steady diet of pancakes with butterscotch chips like I did. 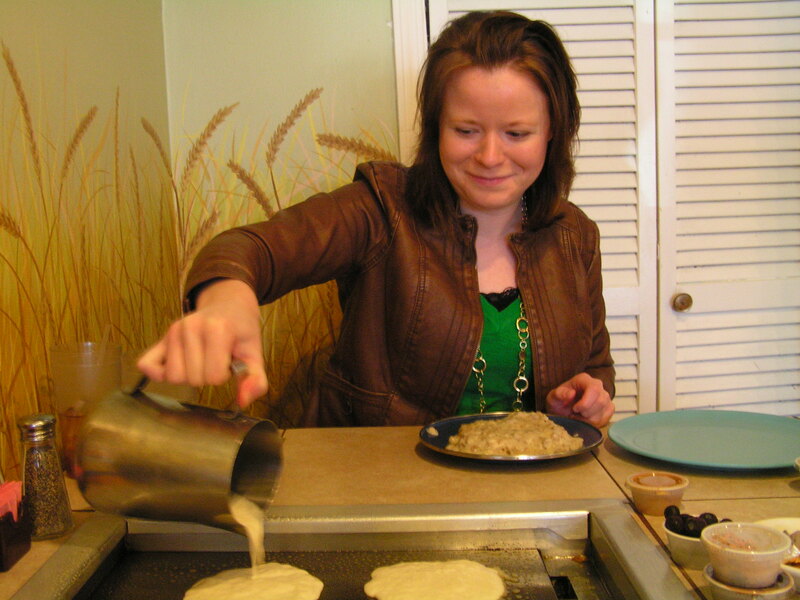 Here she is concentrating very hard on the first batch of pancakes. Note the stunning, handpainted wheat mural on the wall behind her. We admired that and analyzed the technique while waiting for our pancake batter to arrive. 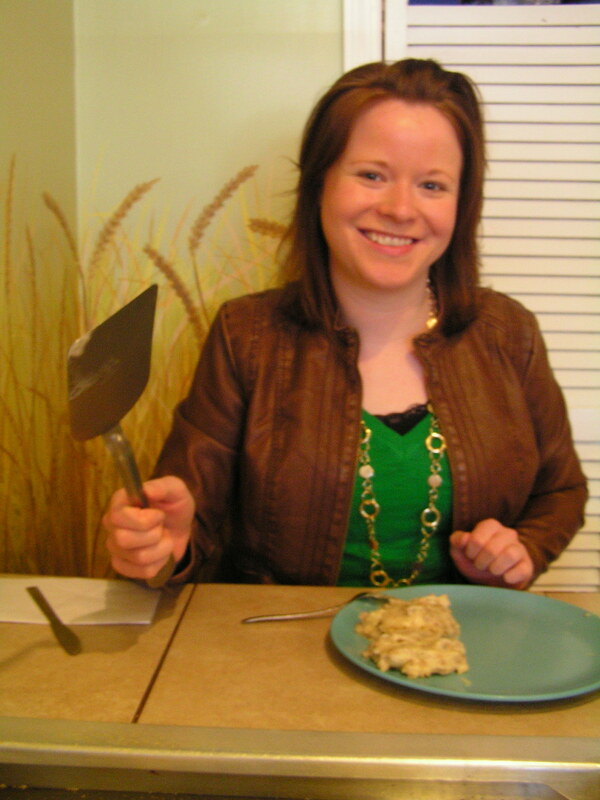 But, in the end, Jillian conquered pancake making in high style. Note on her plate the biscuits and gravy that we also enjoyed while eating our breakfast. And, the last two places to get shout outs in the food post are The Genghis Grill and The Coffee House at Second and Bridge. Eating at The Genghis Grill was technically cheating since they are a chain, but we had never heard of them before. It turns out my sister actually has one somewhat close to her. And, I just suggested that the chain expand to my city. I’d jump up and down if I found out that I was getting a Mongolian grill near me (and no, the one at the local Chinese buffet does not count). The coffee house was an old house in Franklin that had been converted to a coffee house. It was particularly nice because the owners didn’t open up the floor space. They kept rooms in tact and made them into themes. Jillian and I read on the formal sofa and wing chairs of the tea room while a guy worked quietly on his laptop in the corner. There was also a kids room with stuffed burlap sacks strewn on the floor for the kiddos, a library, a cafe, and a music room where patrons could play old records on a record player. A couple was on their first date in that room. Since I’d shed tears the night before over the fact that our trip fell on the one year anniversary of my break-up, I silently wished them better success. It was a nice place to start a relationship. So, there you have it. The food of the South. I came back inspired to venture out and try more of the local establishments around me, but I don’t think I’m going to find that good Southern cooking. I’m going to have to settle for some Amish desserts. This entry was posted in that's life and tagged travel. Bookmark the permalink.